This is no time to be timid or uniformed, you are compelled to do something. There are many critical and timely strategies to deploy as we get deeper into the ASF saga. I am just back from a long weekend in Tennessee where we had the opportunity to ride a motorcycle on a stretch of asphalt known as Tail of the Dragon. That’s 318 turns over the course of 11 miles, and the bike was seldom upright before another corner required a significant lean. Iowan’s don’t get many chances to ride roads this interesting, and my lack of experience showed every now and then. Not much room for an “oops” moment as a slip in concentration could quickly lead to collateral damage. Inevitably, we came into corners a bit too fast and had a moment of truth. Do I center myself on the bike, jam on the brakes and hope the anti-lock feature will bail me out — OR — do I trust the physics by adjusting my riding position, dropping a knee toward the ground while maintaining an arc? Little time to think when you find yourself in that predicament as fear chokes your throat and trees approach fast. At first, I tried the salvage technique of hitting the brakes and hoping I did not go too far off the road. Later, I found enough nerve to lay the bike down a bit more aggressively and pull through the turn as if I had planned it that way. It was scary … and exhilarating. I bring this up because we are facing some scary and potentially volatile times in the hog market. Common sense may say to pin the brakes and hang on. But these are opportunistic times, and I am going to encourage you to consider leaning into the situation and carving a clean line. Here is how that might look in our current African swine fever environment. ASF is exploding in China. I do not write that line lightly. After a few weeks of hit-and-miss cases being reported, we had five reported in one day. Chris Rademacher from Iowa State University Extension does an excellent job of keeping us apprised via his Twitter account (picture attached) of the number of cases as they break, he has seemingly given up with exact counts calling the total “somewhere around 15, plus or minus a couple”. That type of language should catch your attention. In a recent interview on Bloomberg, Brett Stuart stated that ASF will lead to the death of millions of pigs in China. Note the lack of qualifiers in that statement. No mention of “could” or “might,” Brett goes straight to WILL. I have a ton of respect for Brett and his work, he is not one to make outlandish statements. This is noteworthy. So, we are in what looks to be a binary situation. We, being the United States, either stays clean of ASF and gets to participate in an explosive opportunity or we are riddled with the disease and in the same soup as the rest of the world. This one appears to be an “either/or” situation, not a both. Quantifying the impact is more difficult, but let’s give it a shot using recent history as a guide to price impact. In 2008, China experienced what was referenced as blue ear disease, essentially a variant of porcine reproductive and respiratory syndrome. The best guess is that production was reduced somewhere between 5-10%. 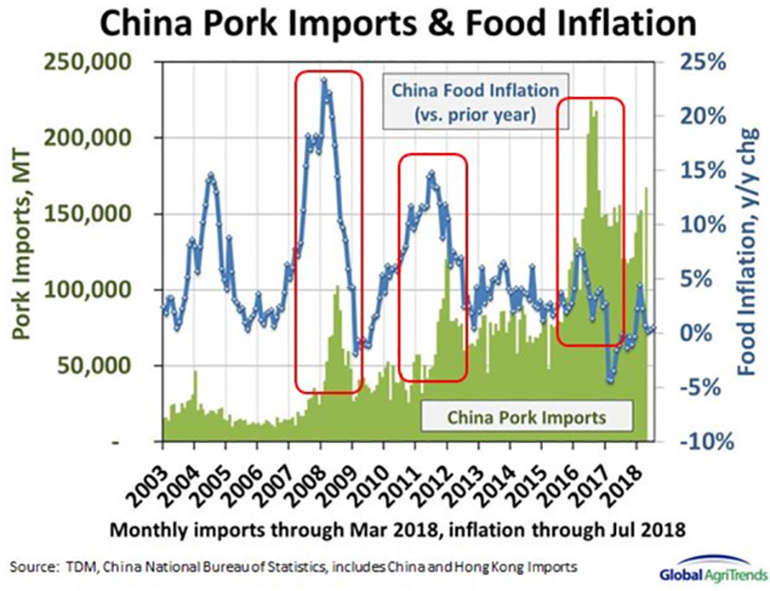 Pork imports rocketed higher to then-record levels and pork prices in the United States rallied from the $60 area up to $90 — a record price at the time. Chinese imports surged again in 2012 and prices rallied smartly into the summer. We are currently on the cusp of what could be a more important development that needs to be respected. 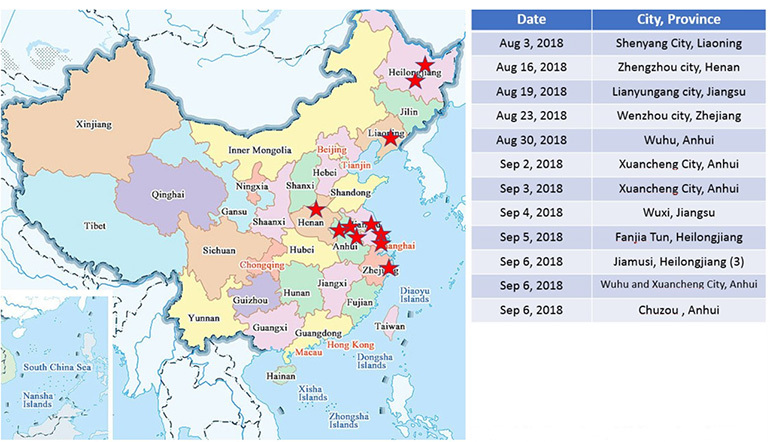 If the current ASF situation were to impact 10% of Chinese production, that would equate to roughly half of U.S. supplies or roughly six times greater impact than our porcine epidemic diarrhea experience. My point is this: we have seen a pronounced (and likely justified) jump in option volatility in the hog market. Whatever the ultimate outcome, we are on the front end of the situation right now and there are many more twists in the road to negotiate. It is imperative to model the “what-if” scenarios and discern their impact to your operation and finances. This has to be a nimble and dynamic evaluation that you are willing to revisit often as the tale plays out. This is no time to be timid or uniformed, you are compelled to do something. There are many critical and timely strategies to deploy as we get deeper into the ASF saga. Among these are the obvious candidates — selling futures or forward contracting with your packer; but these times will also require more creative, diverse and unorthodox strategies. You will be best-served to participate actively and not allow fear to ruin your ride. Pendulum swings from discount to premium … why?